On the ballot in D.C.: The potential political comeback of former mayor Vince Gray and an effort to make the District the 51st state. Editor’s note: This D.C. voter’s guide is part of a WTOP series previewing races and ballot measures, and providing voting information for residents of D.C., Virginia and Maryland. WASHINGTON — Election Day in D.C. could spell the political comeback of a former mayor once under a federal investigation and will present voters with the first opportunity in more than three decades to approve a ballot measure aiming to transform the capital city into the 51st state. Ward 7: A political comeback for Gray? Former one-term D.C. Mayor Vincent Gray, who was ousted from office after losing the 2014 Democratic primary to political rival Muriel Bowser amid a federal corruption probe, is angling for a political comeback. Several Gray aides pleaded guilty to felonies surrounding the use of an illegal “slush fund” used to help elect Gray in 2010. But federal prosecutors failed to link Gray to any crimes and late last year announced they were ending their probe. In the D.C. Democratic primary in June, Gray defeated incumbent Ward 7 council member Yvette Alexander, a key Bowser ally on the council. In next week’s general election, Gray faces two independent challengers. Gray goes into the race with several advantages. Before being elected mayor in 2010, Gray served for six years on the D.C. Council, including two years representing Ward 7 and four years as council chairman. In addition to name recognition, Gray has far outspent his opponents. As of Oct. 10, the Vince Gray 2016 Campaign Committee had spent some $34,000 on his election bid since the Democratic primary, according to online campaign expenditure records. Online records list no campaign expenditures by either of Gray’s opponents — Gary Butler and Christian Carter. There are six candidates on the ballot running for a four-year term as an at-large D.C. Council member. Voters will pick two. David Grosso, who has served as an at-large council member since 2013, is one of two independents currently sitting on the council. Democrat Robert White, who served as legislative counsel for D.C. congressional delegate Eleanor Holmes Norton for several years, defeated former council member Vincent Orange in the June primary. White got an early start on the council — the D.C. Democratic Party voted in September to appoint him to Orange’s seat after the lame-duck council member resigned five months early amid controversy over a position he accepted with the D.C. Chamber of Commerce. Grosso and White have far outspent the other candidates running for at-large seats. As of Oct. 31, the White campaign had spent upwards of $175,000 on his bid, according to online campaign expenditure records maintained by the D.C. Office of Campaign Finance. Grosso had spent $146,000 on his re-election bid. Online records show John Cheeks’ campaign had spent about $3,500 and G. Lee Aikin about $1,437. Carolina Celnik, a D.C. lawyer who’s making a bid for one of the open at-large seats, has the distinction of being the only Republican on the ballot in D.C. — aside from Donald Trump and Mike Pence at the top of the ticket. It has been more than a decade since D.C. voters last elected a Republican to the council — Carol Schwartz won an at-large council seat in 2004. Celnik has spent about $8,300 on her bid. For the first time since the 1980s, the campaign for D.C. statehood is back on the ballot: D.C.residents will vote Nov. 8 on whether to sign off on a recently drafted constitution for the proposed state, approve newly redrawn borders and give District officials the go-ahead to push the U.S. Congress to act on their petition for statehood. In 1982, District residents approved a push for statehood by a margin of 53 to 47 percent, although the effort died in the U.S. Congress. Read more about the statehood ballot referendum. Del. Eleanor Holmes Norton, who has served as D.C.’s nonvoting member of Congress since 1991, faces two challengers: Libertarian Martin Moulton and D.C. Statehood Green Party candidate Natale (Lino) Stracuzzi. Ward 2 council member Jack Evans, who has served on the council since 1991 and currently serves as the chairman of the board that oversees Metro, is running unopposed. Brandon Todd, a close ally of Mayor Bowser who won a 2015 special election to replace her on the council after she won the mayoral race the previous year, is running unopposed for a full term on the council representing Ward 4. Democrat Franklin Garcia is running unopposed for a second term as “shadow” U.S. representative, a largely ceremonial role designed to promote efforts by the District to achieve voting rights in the U.S. Congress. Voters also will select an at-large member of the State Board of Education and select education board members in Wards 2, 4, 7 and 8. Find a full list of candidates here. Polls are open between 7 a.m. and 8 p.m. on Nov. 8. Find your polling place on the D.C. Board of Elections website. 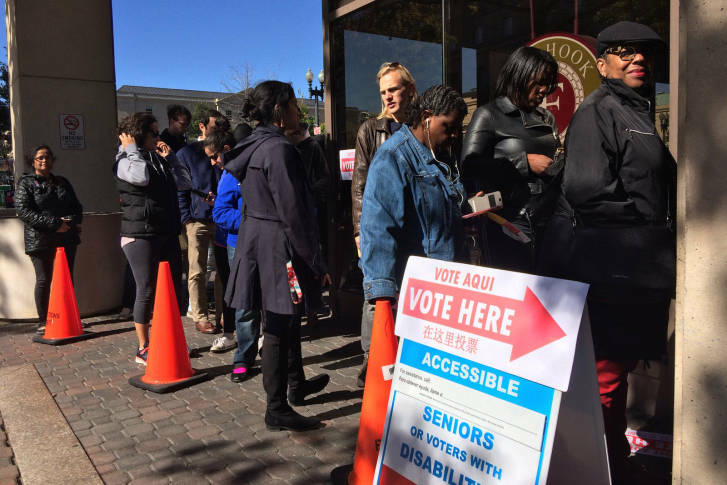 D.C. allows same-day registration during Election Day and early voting. Voters will need to bring proof of residence, such as current government-issued photo ID or a copy of a current utility bill, bank statement or paycheck that shows the voter’s name and address. Voters can peruse a sample ballot on the Board of Elections website. And if you’re addicted to Instagram, don’t worry. There’s no ban in D.C. on taking selfies at the ballot box. Election officials may discourage voters from taking pictures but won’t stop them, a D.C. Board of Elections spokeswoman said. There are nine early voting locations across D.C. Early voting runs through Nov. 4. Same-day registration is available at all early voting centers. Find the full list of early voting centers, hours and wait times. Requests for absentee ballots can be submitted on the Board of Elections website. Requests must be received by Nov. 1, and ballots must be received by the board of elections by 8 p.m. on Election Day.